Today, we’re back on topic with a look at the major glyph choices for a raiding elemental shaman. To avoid a mammoth style wall of text crit, this section will focus purely on our major glyph choices. With a wide variety of glyphs out there, how do you know which to choose? The awesome value of glyphs is that switching them is now simple enough to allow you to carry multiple glyphs and change them to suit the encounter. 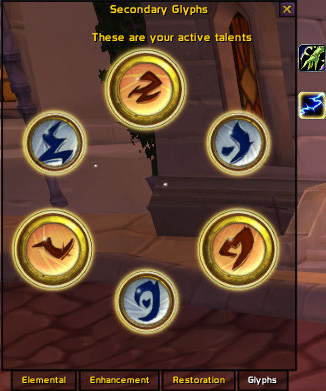 What follows is a look at the various glyphs and their value to raiding elemental shaman. Since patch 3.3, the choice between our major glyphs has become more of a grey area. While there are two outstanding winners (Glyph of Lightning Bolt and Glyph of Totem of Wrath), the third slot is up for contention. There are two contenders and both offer a very close DPS increase. Due to this, the choice becomes more circumstantial and based upon your own gear, your raid setup and even the encounter at hand. I’ll review the glyphs below and then detail how to make the choice at the end of this article. I’m going to start with the essential major glyphs. Increases the damage dealt by lightning bolt by 4%. When you cast Totem of Wrath, you gain 30% of the totem’s bonus spell power for 5 minutes. Our rank four Totem of Wrath provides a 280 spell power increase to ourselves and all members of the raid. This results in the glyph offering an additional 84 spell power boost to ourselves. As this glyph provides a clear cut increase to our spell power, it effects all our spells and it’s value is easy to see. According to the Zap! 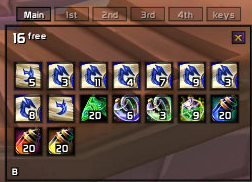 spreadsheet, this glyph is worth around 170 DPS. Note:- You have to place the totem to gain this additional spell power. For shaman using fire DPS totems, you need to cast Totem of Wrath first and then lay your DPS totems. The buff will then last for five minutes. Ensure if you’re using your Fire Elemental Totem, that you have enough time left on the glyph buff to see you through the duration of the totem. Your Lava Burst spell gains an additional 10% of your spellpower. Lava Burst is our hardest hitting and highest priority nuke (excluding the Flame Shock we cast first prior to give the guaranteed critical strikes). According to the Zap! spreadsheet, this is worth around 120 DPS (roughly the same value as Glyph of Flametongue). However, as of patch 3.3 when our Glyph of Flame Shock was altered, this became an equal DPS increase to the above mentioned Glyph of Lava. They’re both worth around 120 DPS according to the Zap! spreadsheet. There is an evaluation of the comparison between these two glyphs at the end of this article. Reduces the cool down of your Fire Elemental Totem by 5 minutes. Quite recently, the cool down on our Fire Elemental Totem was reduced to ten minutes. Using this glyph therefore, reduces it to a five minute cool down. The duration of our fiery friend is two minutes (assuming he doesn’t die early or accidentally gets recalled *ahem*). Over the course of this two minutes, he will contribute around 1.5k DPS on a single target. Due to his AoEs, which you can read more about here his output increases on multiple targets. In most cases, the default cool down is already short enough that you can pop your Fire Elemental Totem once per boss fight. On the other hand, fights are generally too short for you to gain benefit of popping the totem twice and that basically costs you the DPS loss of another major glyph. In addition to this, if the elemental dies prematurely, the DPS increase is cut dramatically. The value of this glyph therefore, comes in longer fights where you can both use the Fire Elemental Totem twice and almost always guarantee it’s survival and contribution for the full duration. An example of this would be the Lich King fight. A totem popped at the start of phase one will expire just before a transition switch (depending upon your DPS). It can then be dropped again once off cool down which should occur around the start of phase three when the boss positioning is relatively static. It can be worth carrying a few copies of this glyph in your bags and using it for the Lich King encounter (if you’re free to use fire DPS totems naturally), just remember to carry replacement glyphs for the shorter fights or you are pretty much sacrificing a major glyph slot. Use: Increases the critical strike damage bonus of your Flame Shock damage by 60%. This patch was changed in patch 3.3.3 when flame shock was revamped to be able to crit by default. It went from being one of our strongest glyphs to one of our weakest. While it may look good on paper, it simply doesn’t produce competitive DPS compared to the other major glyph contenders. According to the Zap! spreadsheet, it’s offering an increase of just 80 DPS. Reduces the cooldown of your Elemental Mastery ability by 30 seconds. While our Elemental Mastery ability is a fair PvE cool down, it’s simply not strong enough to make this glyph valuable. Reduces the cooldown of your Fire Nova spell by three seconds. When combined with the Improved Fire Nova talent, the cool down on your Fire Nova can be reduced to three seconds. Fire Nova is primarily used in conjunction with our Magma Totem and can cause devastating AoE damage. In a pure AoE scenario, the reduced cool down offered by this glyph can result in a DPS increase around the 500 mark. However, on single targets, this glyph is worthless and the smaller the AoE pulls, the less value the glyph has. In addition, the typical annoyance of using the Magma Totem and Fire Nova combination is that you need the mobs to be tanked statically. As soon as you have to start running around and repositioning totems, the value of this decreases. If you have an area of trash incorporating multiple large AoE pulls, then this glyph could be fun to switch in for additional DPS. The trash towards Sindragosa could be a good scenario for this glyph, with a gauntlet style room followed by large whelpling pulls before you reach the dragon herself. Perhaps the trash moving towards the Prince Council and then the Blood Queen also. Remember that this glyph is next to worthless on single target encounters (and thus, most boss encounters) so if you are going to switch in this glyph for AoE pack fun, carry spare copies of your primary DPS glyphs to avoid a wasted major glyph spot. Recommendation Level – Highly Circumstantial / Not Recommended. Our Chain Lightning suffers from a 30% damage reduction with each “jump” it makes and by default effects three total targets. Whilst this glyph will enable the chain to make an extra jump, the final target will also suffer an additional 30% reduction making this final hit relatively weak. Recommendation Level – Not Recommended. Our Stoneclaw Totem is quite a useful totem, though doesn’t have a much of a role in a PvE raiding environment and thus, is often overlooked. As well as taunting any mob in it’s vicinity, the stoneclaw totem will place a shield around all your totems, protecting them from damage. This glyph extends this shield to the elemental shaman along with increasing it’s strength, allowing it to absorb 4340 damage over 15 seconds. While this glyph doesn’t have much place in a raid environment, it is useful in PvP and while levelling as a shaman, thus it deserves a mention. I’m also aware of some elemental shaman’s that use this glyph and the corresponding totem during the faction champions encounter in the Trial of the (Grand) Crusader raid. Personally, I lean towards using either a Tremor Totem or an Earthbind totem but if the shield provided can be the difference between life or death, then there’s certainly a value to be considered. Recommendation Level -More for PvP / levelling than for PvE raiding. Reduces the cooldown on Thunderstorm by 10 seconds. Again, this glyph has it’s place but not particularly in a PvE environment. Most elemental shaman don’t find themselves having such mana problems that a 10 second reduction on Thunderstorm’s cool down is essential. While it is arguably nice, it would mean sacrificing a glyph that actually increases our damage output. If you wanted a pure AoE build, this combined with the Glyph of Fire Nova could be an interesting combination. On the other hand, in PvP, Thunderstorm is an excellent (and fun) ability in it’s unglyphed state and reducing it’s cool down can be great for survivability. Again, mana problems in PvE are not something elemental shaman generally suffer with (and most who do are more likely to find that they are forgetting to refresh their Water Shield charges in highly DPS focussed encounters). Reduces the global cooldown triggered by your shock spells to one second. In a PvE situation, our most commonly used shock is Flame Shock. At minimum we refresh this once every 18 seconds (less if you’re using two part tier 9 or four part tier 10). There are occasions where you will find yourself using Frost Shock also in PvE, either because you’re moving or because a target needs slowing (Valkyr’s in the Lich King encounter if no one else is slowing or things are desperate spring to mind.) If you’re moving the reduced cool down is quite void anyway since the chances are you have global cool downs to spare and are using Frost Shock for instant damage without stopping. Therefore, in PvE, it’s quite useless. In a PvP environment, Frost Shock becomes more valuable but personally, I find Glyph of Thunder and Glyph of Stoneclaw Totem more useful. In a PvE raid situation, there are few places you will find yourself Hexing. The faction champions encounter in Trial of the (Grand) Crusader maybe one, Kel’thuzad in Naxxramas could be another. Either way, if you’re using any form of crowd control, people should not be hitting the target. If they are, the answer is more likely to lay in addressing this problem than in glyphing your Hex skill. This glyph could have more value in a PvP scenario, but again, it’s my opinion that there are more valuable PvP glyphs out there than this. Glyph of Flametongue of Glyph of Lava? If you’re looking for a definitive answer, you’re going to be hard pressed to find one. The actual values of these glyphs vary from player to player depending upon their gear. As you start to reach best in slot levels of gear, (boasting very high levels of haste and spell power), crit becomes more valuable to us. Glyph of Flametongue provides a 2% critical strike chance increase across all our spells. This does not affect Lava Burst because when used correctly (that is to say, cast when Flame Shock is already present on the target), it produces a guaranteed critical strike. At the exact opposite of this we have Glyph of Lava which boosts our Lava Burst but doesn’t influence our other spells. Taking the above into account, the value of each glyph varies depending upon the encounter mechanics, your gear and to some extent, your raid setup. Let’s look at these now. In a fight with multiple targets where you’re utilising Chain Lightning, a higher percentage of your damage will be coming from your chains. In this case, a 2% critical strike increase will benefit you more than an increase to your Lava Burst. In a fight with a great deal of movement where you struggle to maintain a high DPS uptime, then you’ll cast fewer and fewer filler spells. Your priority spell will still be your Lava Burst so the chances are that a greater percentage of your damage will come from this source. In this case, it would be better to use Glyph of Lava Burst and increase the damage on these hits. If an encounter requires a period of sudden, high burst damage, Glyph of Lava will deliver this. Critical strike chance still has an element of randomness. Where as a solid boost to your hardest hitting nuke is more reliable and a static DPS increase. Does your raid have a demonology warlock? If so, his Demonic Pact will offer more spell power to your raid than your Totem of Wrath. In this situation, you should switch and use fire DPS totems. Both your Searing Totem and your Magma Totem utilise your critical strike rating at the time you drop them. In this situation, having a higher level of crit for yourself (via Glyph of Flametongue Weapon) will produce a higher level of crit on your totems. Does your raid boast a boomkin? If so, then the haste aura provided should be taken into account when looking at your own levels of haste. As mentioned earlier, the higher your own haste, the more valuable crit becomes. In addition to this, you should consider your own cooldowns. Are you an engineer? Do you have the haste effect on gloves and do you remember to always use it when it comes off cooldown? Are you a troll? If so you have your racial to consider also. If you’re managing high levels of haste throughout an encounter, then the value of Glyph of Flametongue will become higher. Why? quite simply because haste effects your Lightning Bolts and now your Flame Shocks too. It has very little effect on your Lava Burst. As such, a higher percentage of your damage will be coming from Flame Shock and Lightning Bolts. High latency or low FPS both affect your DPS enormously. Due to the fact Lava Burst is our highest priority spell, it’s likely that your filler spells suffer more from these problems. As such, Glyph of Lava is probably a better choice. On the note of lag, if you haven’t yet read Charles’ amazing in depth look at how lag can impact your DPS, go and read this as you may find it very eye opening! You can find it here. The third spot is more debatable and you should consider all the above factors before making your choice. Glyphs can be substituted easily during a raid now. As such, my personal advice is to carry a stack of both Glyph of Flametongue Weapon and Glyph of Lava. Assess each encounter individually and make your choice based on that. In addition, I carry a stack of Glyph of Fire Elemental Totem and I use this on two main fights; Lady Deathwhisper Heroic (where I pop my Fire Elemental Totem at the very start and then again in phase two) and the Lich King encounter. Remember also that utilising the Zap! spreadsheet is an invaluable source of determining an individual glyph’s value to you.